I am so excited that we are moving ahead with the inventory, copying and preserving items in our History Center. Jim Pearce, Steve Abbott and Joe Dobrowolski have consented to put this in motion. Committee of the History Center: RoseAnne Lamb (Chairperson), Ralph Carhart, and Lois Frazier. This committee will monitor the activities and have the authority to make decisions. Additionally, I have asked former presidents Warren McWilliams, Pete White and Ralph Carhart to serve on a F.O.H.S. Logo committee. They have requested further time to review the submitted proposals and plan to report back at the June 21 Board meeting. Warren, THANK You for installing the new officers. It is serious business! 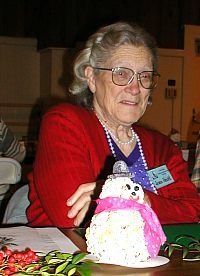 JoAn Heidt created cheerful popcorn snowmen as table decorations. Gordon and Joan Heidt were docents at the History Center on March 13th. Fran Sargent, Lois Frazier, Larry and Meg Smart have also been docents this year. The History Center is in the Administration Building at the Fair Oaks Cemetery. The hours are 1:00 to 4:00 pm every 2nd Sunday of the month. If you would like to be a docent, call 967-2967. The Fair Oaks Fiesta will be on April 30th and May 1st. The Historical Society exhibit will be in the Old Library Building. Volunteers to work 2 hour shifts will be needed for these two days. The Memorial Day Celebration at the Fair Oaks Cemetery will be on Saturday, May 28th. This year will honor The National Guard. An outstanding musical program, honored speakers, and placing the wreath will make this a most patriotic event. 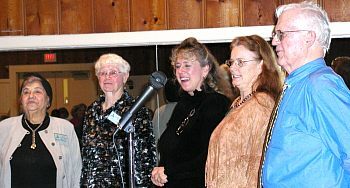 The Historical Society and the Orangevale (Fair Oaks) Grange will furnish the refreshments. We will need 15 people to bring 2 dozen cookies. A sign-up sheet will be available at the April potluck. Our guest speakers will be Todd Sebastian, Recreation Superintendent, and Sam Crawford, District Administrator for the Fair Oaks Park District. Todd has been with the District for 2 years and is currently running for Chamber's Honorary Mayor of Fair Oaks. He is fundraising for the Save the Bluffs Foundation. At the Fair Oaks Fiesta, the winner will be announced. Sam has served as administrator for the Park Board for 7 years. 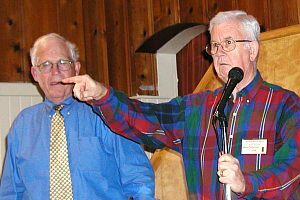 The two men will tell of the history of the Fair Oaks Recreation and Park District. We look forward to hearing what the District has achieved and what is on the horizon. The schedule of offerings are always interesting and will come just in time for summer and outdoor activities. 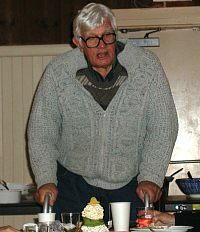 Farmer Bob, ever the great F.O. Storyteller! 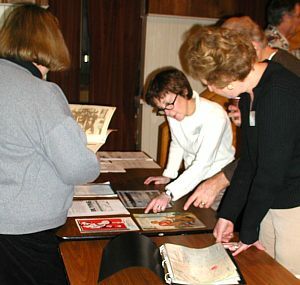 Nancy White and others browsing January's display. I would like to take this opportunity to thank the dozen members who shared their entertaining stories about their experiences at schools in Fair Oaks. To illustrate just a few: Betty Anne McArthur told of going to school at the original Fair Oaks School. She fessed-up about the mischief she and her other classmates used to get into with the music teacher. How ironic that she became a music teacher for schools in Fair Oaks. Marilyn Pearce shared several memories from the 14 years that she taught at Fair Oaks Preschool. Pete White spoke of going to school one day when he was in the first grade and losing some of his classmates. He could never figure out what happened to them. Warren McWilliams shared stories of school teachers living in the boarding house, working in the cafeteria and at school dances. Janet McWillliams told the "rest of the story" for Pete White. There were too many students for the first grade so, one day, the principal just came in and picked a group of students to be transferred to the second grade which had fewer students. Pete lost his classmates and continued to look for them during his school years at Fair Oaks Elementary School. Pete was left behind. William (Bill) Hinsey talked about his grandfather's involvement in the school district since 1904 and the attendance of his father, himself, and his children in our schools. June Melvin shared her knowledge of John Holst School and the folk dancing festival. Sherry Lynn Wood shared about coming from a long line of school teachers in California dating back to the 1840s. She was proud of how she went to the San Juan District office when she was 15 years old and obtained permission to change school due to a family hardship-members in one family household attending six different schools. 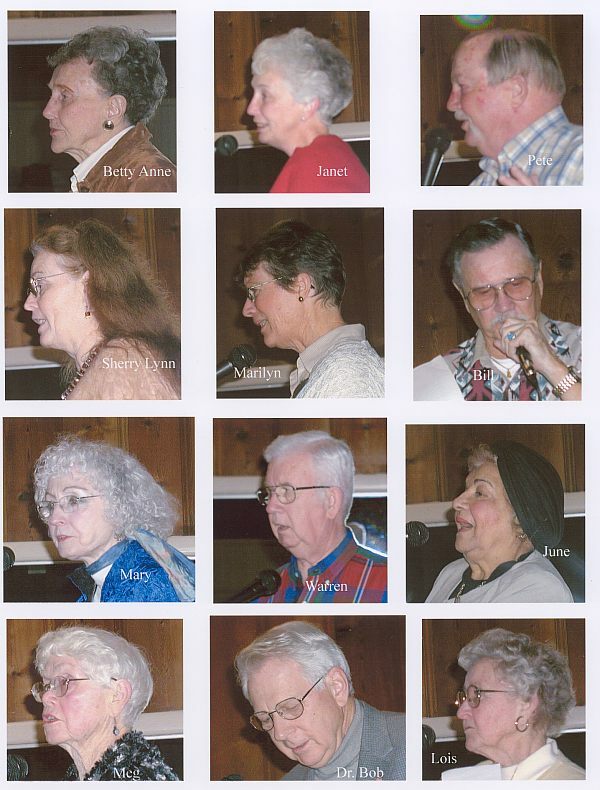 Individuals brought pictures to share of the school years in Fair Oaks. Old friends and members brought good food, good fun, and good memories to share. A great time was had by all! 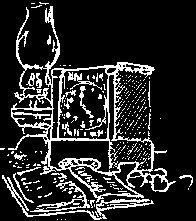 The Fair Oaks Historical Society Website is fairly stable now, with most activities on auto-pilot. The Webgroup is beginning our next major project, the FOHS Museum and History Center section on the website. We also have the Museum Inventory project to get going. While considering activities in this area, a number of policy and procedure issues developed, and we realized that if we had to wait for Board Meetings for each unanticipated issue, we'd never get done. So, we asked Russ Monroe for a committee which could expedite such decisions. On March 30, FOHS Preservation Committee members Lois and RoseAnn, along with Steve Abbott and myself met with the Sacramento Archives and History Center staff in their facility off Richards Blvd. in Sacramento to learn all we could about their processes and policies. As always, we welcome your comments and suggestions. Please check out the website at www.fairoakshistory.org. Comments: Farmer Bob's home is a familiar sight while driving on Sunset Avenue. It has 4 bedrooms, 2 baths, living and dining rooms, a breakfast nook plus back porch. Above ground it is 2400 sq. ft. with a full basement. In the near future his produce/firewood business will be replaced with several upscale homes. He and Beryl will continue to live in their home! Bob's parents bought the property as an orange grove in 1910. The elms in the yard were planted at that time. They lived in the "pioneer" home on the property until the new home was built when Bob was 7 years old. 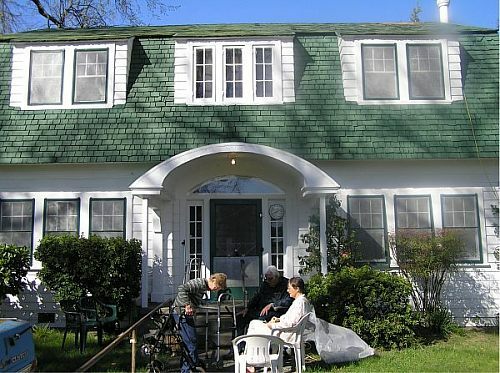 Bob and Art Broadley built the home. Murray, another brother, was the plumber. The old home was torn down. In and beyond the World War II years, Bob and Beryl lived in another Fair Oaks home. When Bob's parents passed away in the 70's, Bob and his wife bought his sister's interest in the house. They raised their daughters, Janice and Susan in the home. The sign at Farmer Bob's says established in 1975 for local produce and the best wagon rides before Halloween.